Spain's Mourn seemed to first get some press 'cause of their association with Hinds (previously named Deers) but, in reality, there's more ferocity here. 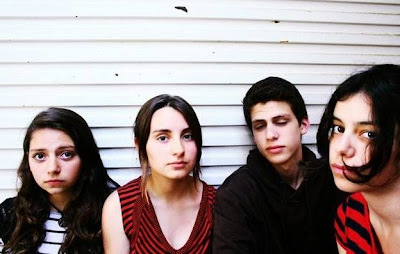 Mourn sound remarkably like classic era PJ Harvey with a hint of early Throwing Muses thrown in for good measure. If Kim Gordon had formed a punk band when she was the age of the members of Mourn, it would haved sounded a lot like this, I think. The self-titled debut album from Mourn is out on Tuesday via Captured Tracks and it's an affecting and exciting record. From the surging "Otitis" to the riff-riding "You Don't Know Me" and on and on, this is an LP of tremendous power and immediacy. Recorded in a 2-day blast of activity, the album bears the direct DIY electricity of an early Dischord Records release. With no track getting past the 3-minute mark -- and most under 2 minutes -- the 11 songs here are all perfect examples of a sort of music that is in short supply these days. But all that's not to peg Mourn as punk revivalists or something. While an astute listener can easily sort of pick out the influences of this band, Mourn are making something unique here that impresses not so much because its makers are so young but, rather, because it's such a blast of energy. A song like "Jack" owes a lot to Sleater-Kinney and Bikini Kill. There's no denying that but what remains a revelation is how catchy the song is, even if it's over nearly as soon as it begins. The spectacular "Silver Gold" (which you can download below) is like some perfect melding of The Slits and Patti Smith. It's a shockingly bracing slice of fury and I guarantee you that you'll hear little else like it this year from other bands. But, hey, I could say that about all 11 cuts on Mourn's self-titled debut. Mourn by Mourn is out on Tuesday via Captured Tracks. Follow Mourn on their official Facebook page.